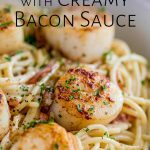 This Seared Scallop Pasta with Creamy Bacon Sauce is such an easy elegant seafood recipe. We all know that pasta carbonara is pure comfort food, but when you add shellfish to your creamy pasta noodles you turn up the notch on dinner! 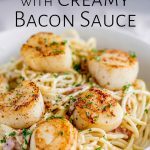 The sauce is a wonderful mixture of white wine, cream, onions, and bacon. 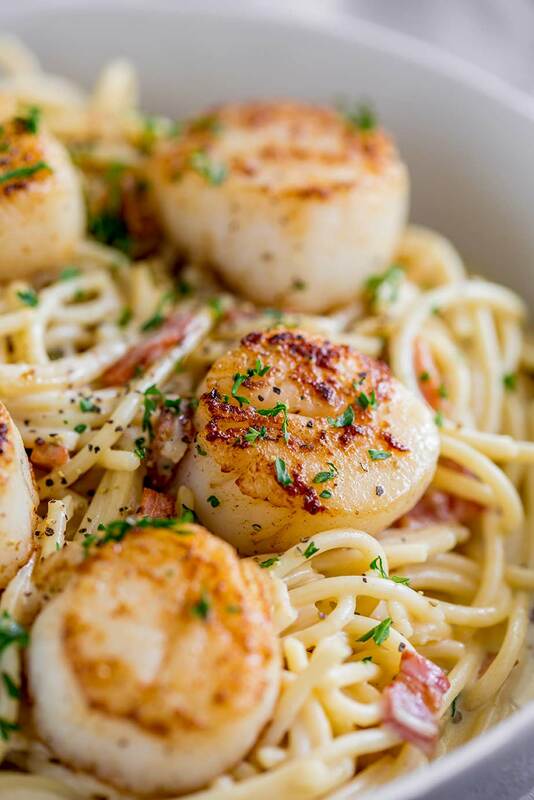 All mixed through spaghetti noodles and then topped with perfectly seared scallops. You can use large scallops or the smaller bay scallops here, both work and both will be delicious. You might be forgiven for thinking that I am turning Sprinkles and Sprouts into a Pasta Blog! There has been a new pasta recipe every week for at least the last month! I do love pasta! And I think you guys do too because pasta recipes seem to be the most popular recipes here on Sprinkles and Sprouts! You all love my Garlic Butter Pasta with Garlic Chicken, and my Shrimp Chorizo Pasta that only went live last week saw so much love as soon as it was published that it made it into Readers Favorites within the first few days! I am not upset by this as pasta is my true love when it comes to food. I have a fair few food crushes and the odd food affair but I always come back to my sweetheart. I actually tested so many pasta recipes last week that I ran out of spaghetti! For a girl who buys it by the boatload, this was perturbing. Don’t forget I once crowned myself the Queen of Pasta! Anyway, enough from me and my pasta addiction, let’s get down to the cooking. The Amazing Pan Seared Scallops. How to make a Creamy Bacon Sauce for Pasta. Start by frying off the bacon to get it good and crispy. Crispy is good, crispy adds flavor, texture and it means the bacon releases all that wonderful bacon grease. Which we need to fry off the onions. Because let’s face it, onions cooked in bacon grease are just better! So use a slotted spoon to remove the bacon, then fry off a chopped onion – brown, white, red…it matters not at all! Add a little garlic and deglaze the pan with a splash of white wine. Don’t worry, if you avoid wine in your diet then you can use vegetable/chicken/seafood broth (stock). After this, the bacon is returned to the pan along with some heavy cream, then everything is simmered gently. SOOOO creamy, delicious and rich! Everyone knows how to cook pasta….Boil water, add the pasta, cook, drain done! BUT I have a few tips for you that will make your pasta next level amazing. Make sure you salt the water generously. The Italians say pasta cooking water should be as salty as the sea! It makes sense when the water is moving into the dried pasta, it will take the salt with it, seasoning the whole of the piece of pasta, making it delicious. Such a simple trick, but one people forget, or they use just a pinch of salt, which isn’t enough. We are talking more like 1 tbsp of salt for a quart of water, which is enough for a pound of pasta! Stir your pasta when you first add it to the pan to separate the strands and ensure your pasta doesn’t stick together. Do not add oil to the pasta water, it stops the sauce sticking and you end up with a bowl of pasta sitting in a pile of sauce!! No, we want the sauce to coat the pasta and make every mouthful taste good. Before you drain your pasta use a large measuring cup to take out at least 1 1/2 cups of the cooking water. This is liquid gold. It contains starch, which when added to a pasta sauce, helps the sauce thicken and stick to the pasta. Plus because we seasoned our water correctly, the starchy water doesn’t stop the sauce tasting good. The perfect seared scallop should have a crisp golden brown crust and be soft and tender in the middle. I am convinced that the people who don’t like scallops have been served rubber ice hockey pucks! Every scallop recipe I have on here goes back to my favorite method for cooking scallops; one I learned from Gorden Ramsey. And I can tell you I am not going to argue with him! You can read my in-depth top tips for “How to Perfectly Pan Sear Scallops” here, but for a quick rundown here are my quick tips. Salt the scallops just before you add them to the frying pan. Once you add the scallops to the pan, don’t touch them. Add the scallops to the pan in an ordered pattern, to reduce the risk of overcooking your scallops. If you are using the smaller bay scallops then they will need less cooking time. Once you have your elements, putting together the dish is simple. Add the pasta to the creamy sauce, stir well and thin with around 1/4 cup of pasta water, adding more water until the sauce is clinging perfectly to the pasta. Add the seared scallops to the top, season with black pepper, lemon zest and maybe a few chopped herbs. Serve and enjoy. Scallops can produce pearls, but they lack the shine and luster of those that oysters produce. This pasta is so delicious and saucy a side of ciabatta bread would be perfect here. But if you want to serve something a little healthy then some steamed asparagus or broccoli rabe work so well with scallops and bacon. But what doesn’t work well with bacon??? Ice cream that’s what….although maple ice cream with crispy bacon? YUM!!! Okay, I’ll stick with my statement that everything works with bacon! 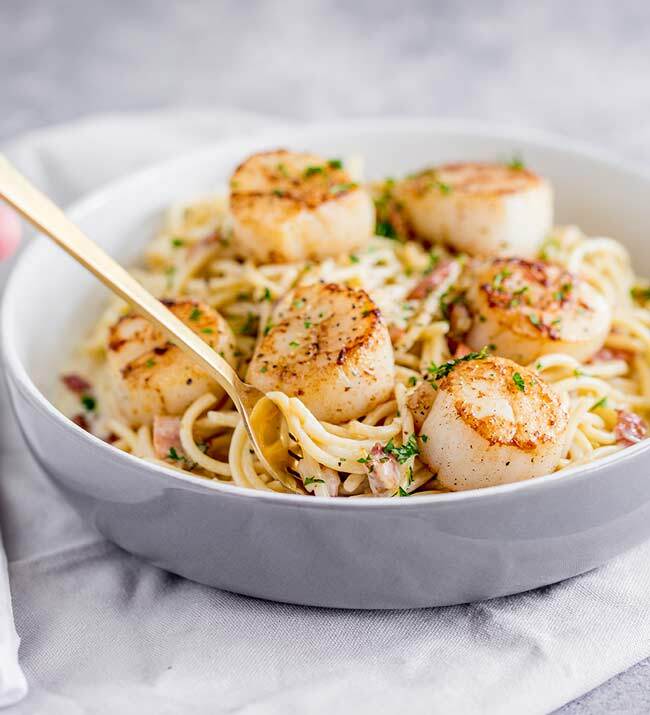 The sweet mild flavor of scallops needs something acidic enough to balance them, but nothing too bold or it will dull the flavor of the scallops. With the addition of cream and bacon, something like a Sancerre or a chardonnay would be perfect. You could also try a French rose. And of course, champagne or prosecco is always a great choice with seafood! 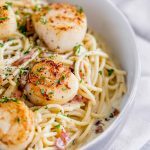 Pin this recipe for Seared Scallops Pasta with Creamy Bacon Sauce. Pin it here. 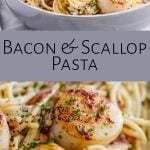 This Seared Scallop Pasta with Creamy Bacon Sauce is such an easy elegant seafood recipe. We all know that pasta carbonara is pure comfort food, but when you add shellfish to your creamy pasta noodles you turn up the notch on dinner! The sauce is a wonderful mixture of white wine, cream, onions and bacon. 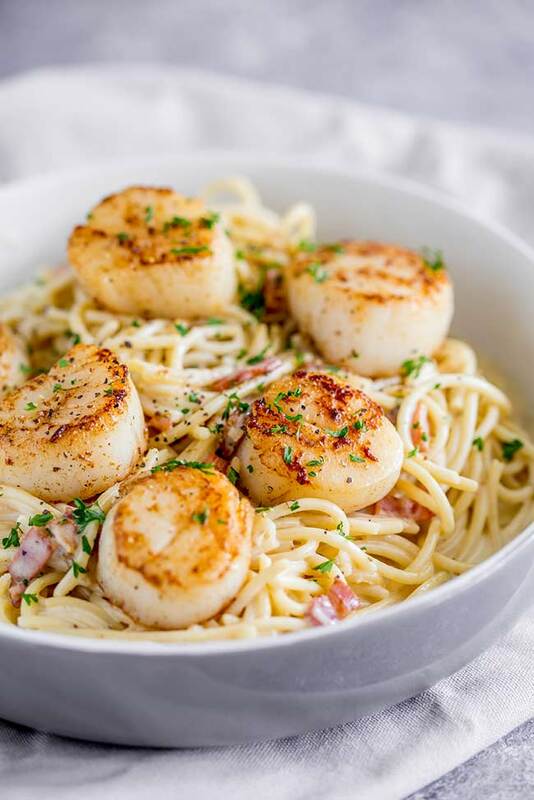 All mixed through spaghetti noodles and then topped with perfectly seared scallops. You can use large scallops or the smaller bay scallops here, both work and both will be delicious. Peel and chop the onion and garlic and set to one side for later. Place a skillet over a medium flame, add the oil and cook the chopped bacon until crisp. Use a slotted spoon to remove the bacon from the pan, leaving the bacon grease behind. Add the chopped onion to the skillet and cook over a medium heat until softened. Add in the garlic and fry gently for 30 seconds before pouring in the white wine (or stock). Cook until the liquid has reduced by half. Reduce the heat and add in the heavy cream and half of the cooked bacon. Bring to a low simmer and cook gently for 5 minutes to thicken, then keep warm over a very low heat. Whilst the sauce is simmering cook the pasta in a large pot of salted boiling water for 1 minute less than the packet suggests. Ensure the scallops are dry by patting them with paper towel to remove any moisture. Then leave them to sit on a sheet of paper towel. Turn the heat off under the pan and add the butter. Once the butter has stopped sizzling, give the pasta a stir and add more cooking water if needed, then serve the pasta with 3 scallops on top. Add lemon zest to the top and a small spritz of lemon zest. Garnish with fresh herbs and black pepper then serve immediately. You can use a brown onion, red onion or white onion here. If you don’t drink wine or use it in your cooking then replace this with broth/stock – vegetable, chicken or seafood broth/stock is fine. 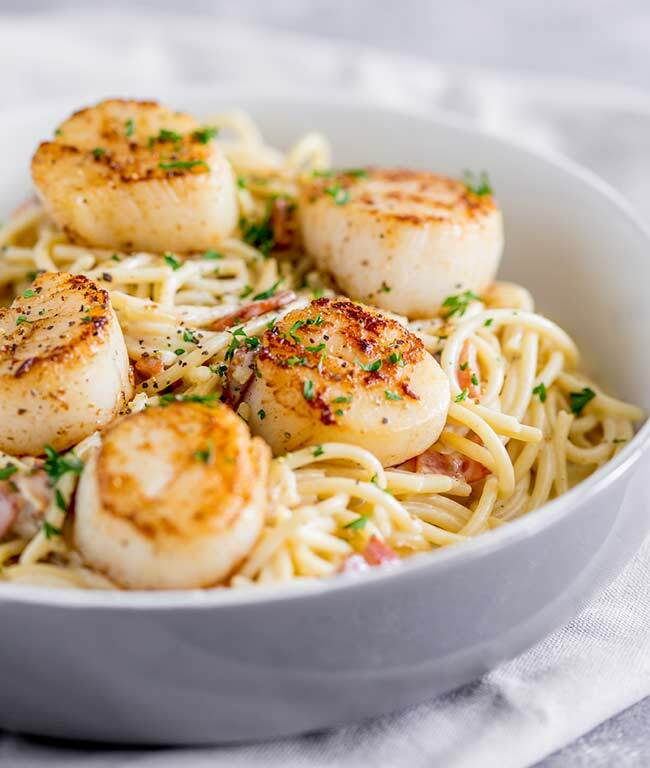 Adding the scallops to the pan in order means you can turn them in order and don’t end up with an overcooked scallop or an undercooked scallop. Hi Claire! I am drooling on my computer looking at this dish! 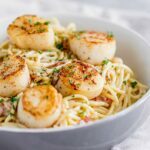 I absolutely love seared scallops and so many people do not know how to cook them. And bacon makes everything better! Have you ever made chocolate chip cookies using bacon grease? SO good! Oh My Goodness!!!!! Chocolate chip cookies with bacon grease????? I am off to google that immediately! I need those in my life! The perfect meal! One I will come back to again and again. Thanks for sharing! I adore this recipe. It’s exactly what I would order if I went out to a restaurant, but it’s so easy to make at home. Definite keeper!